The Norwood was built in 1854 in Sunderland. The owner until 1870, was John Henry Luscombe (1797-1883). She was a convict transport which visited Western Australia’s shores with its human cargo on two occasions (1862 and 1867). Norwood was a London registered 849 ton three-masted ship. She was an oak ‘late frigate’ hull type. 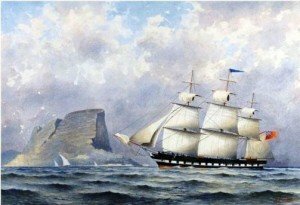 Her dimensions were length: 160 ft; beam 31.2 ft; depth: 20.5 ft; draught 15.0 ft. She underwent some changes to her cladding in 1860 and was in service until 1881, sailing from London to Australia, New Zealand, the Indies and Africa. In late 1860 she served as a troopship, fitted with guns, taking soldiers to New Zealand to fight in the Maori Wars. 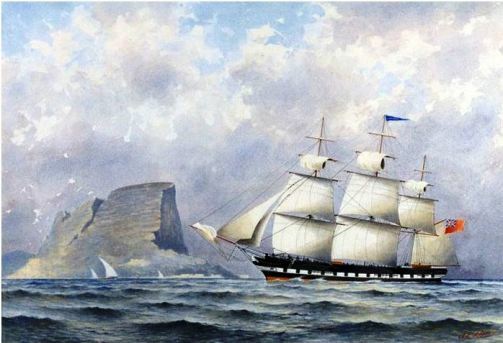 On her first voyage to the Swan River Colony, she left Portland, England on 16 March. 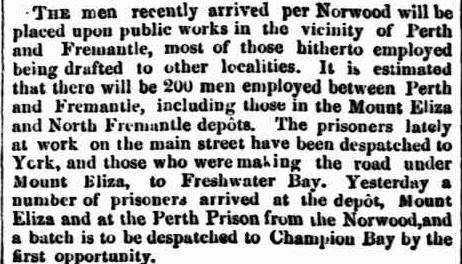 She carried the 25th of 37 shipments of male convicts destined for Western Australia. 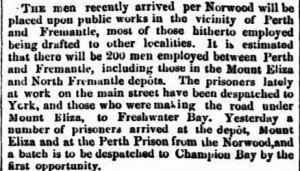 On this voyage the Norwood took 85 days and arrived in Fremantle on 9 June, 1862 with 92 passengers and 290 convicts.. Captain Frank Bristow MN and Dr Alexander Watson RN were the captain and surgeon respectively. Bristow had been captain of Norwood for 15 years from about 1856 to 1870. There were no deaths recorded on the convict shipping and description lists and 290 convict numbers were assigned for the voyage ranging from 6203 to 6492, all of whom arrived. Of the 92 passengers mentioned above, 89 were pensioner guards and their families, the number being made up of 30 pensioner guards, 21 wives, 19 sons and 19 daughters. Three children were born on the voyage to wives of pensioner guards: sons for Peter Lynch and John Flynn and a daughter for John Broadbrook. Four died, children of Lynch, Broadbrook, Henry Dyson Naylor and Michael Delaney. John Carroll, one of the pensioner guards allocated to the Norwood, was dismissed before she sailed (Pay List WO22/226). Nineteen of the pensioner guards were Crimean War veterans. Dr Alexander Watson’s surgeon’s journal for the voyage is preserved in the National Archives, Kew. Researchers can view a copy on the Australian Joint Copying Project (AJCP) microfilm reel 3181 which is held in most major libraries and archives throughout Australia. It can also be accessed by subscription on the ancestry.co.uk website. The Inquirer & Commercial News (1855-1901) bears good tidings of improvements in public works and entertainment from overseas with the arrival of the Norwood. White Wings: immigrant ships to New Zealand 1840-1902, Sir Henry Brett, p. 167. The Sunderland Site, Peter Searle’s Website. Inquirer & Commercial News 18 June and 2 July 1862.